Welcome to the Deadliest Weapon That Never Was. 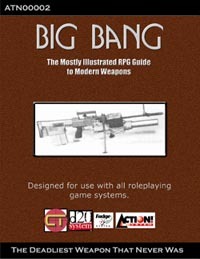 This short addition to the Big Bang line covers an epic failure of a weapon system that haunts the United States Military to this very day. Between 1948 and 1952, the US military learned that 50,000 rounds of ammunition were fired for every enemy casualty caused during World War II, a clear indicator that the much vaunted marksmanship of U.S. soldiers and marines did not actually exist. As the 1950's came to a close, the supposedly obvious cure for this was a superweapon that could fire with beeline accuracy. The result was the Special Purpose Individual Weapon (SPIW) program. Focusing on the use of flechettes, the government expected the program to produce a viable weapon in less than two years at a budget of $20 million. The infant technologies going into the weapon were so promising that the military cancelled all contracts for the continued production of the M-14 rifle. Instead, the concept ballooned, facing impossible weapon specifications, insane budget overruns to the tune of six times the original budget, and endless extensions. With the Vietnam War looming, a shortage of M-14's, and no wonder rifle in sight, the SPIW forced the military into adopting the M-16 rifle before that new weapon was ready for combat. The SPIW program, after evolving into the Serial Flechette Rifle program and Serial Bullet Rifle programs, finally collapsed in 1978, almost 20 years after it began. The primary supporter of the technologies, Aircraft Armaments, Inc., continued supporting the concept all the way up to the early 1990's, developing numerous additional flechette weapon systems for military consideration. A descendant weapon of the SPIW was even entered into the early competition stages for the OICW program. The very same specifications and problems that doomed the SPIW program now 30+ years later also threaten the XM-29 that developed from the Objective Individual Combat Weapon program of the 1990's. This document chronicles the development of the SPIW program and is successors, as well as detailing the numerous prototype weapons produced between 1959 and 1991.